International Self-Care Day (ISD), on 24 July each year, provides a focus and opportunity to raise the profile of healthy lifestyle self-care programmes around the world. ISD provides a media-friendly forum and a focus for individuals and groups to (independently) promote self-care in their organisation or community. Independent events were conducted in many countries, including Singapore, the UK and Canada (see previous news item). 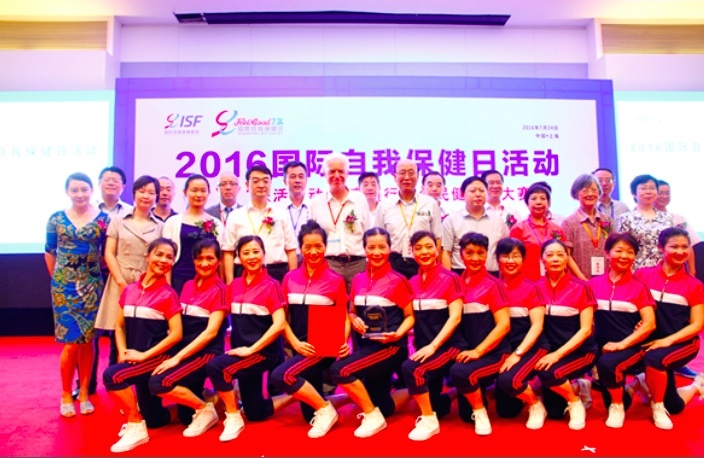 ISF itself organised an ISD event in the Shanghai Science and Technology Museum, Shanghai. Events included the awarding of the ISF World Healthy City Award (see previous news item), a national team aerobics competition for older citizens, and a preview of the forthcoming publication of the “China Self-Care Blue Book.” This is a major publication edited by ISF with other editors including government departments – the National Health and Family Planning Commission of the People’s Republic of China, and the Chinese Center for Disease Control and Prevention. The Blue Book makes a detailed case for self-care in China, as a guide for all stakeholders in health. The China Self-Care Blue Book has been sponsored by Bayer Consumer Health China and will be published in Chinese later in 2016, with an English-language version to follow.